Braille, Stroke and Character Width Templates Use these templates to be sure that the fonts and braille spacing you are choosing are compliant with the standards and codes. Inspectors can use the templates to check characters and braille spacing of signs that have already been installed, providing that the character sizes are 5/8 inch, 3/4 inch, or 1 inch in height. 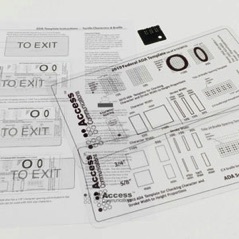 Package Includes: Transparent overlay measurement templates, keychain CA-braille tester & instruction leaflet. Combo package includes Federal & California overlays, CA tester & instructon leaflet. Here are some helpful aids to designing and inspecting signs for ADA compliance.